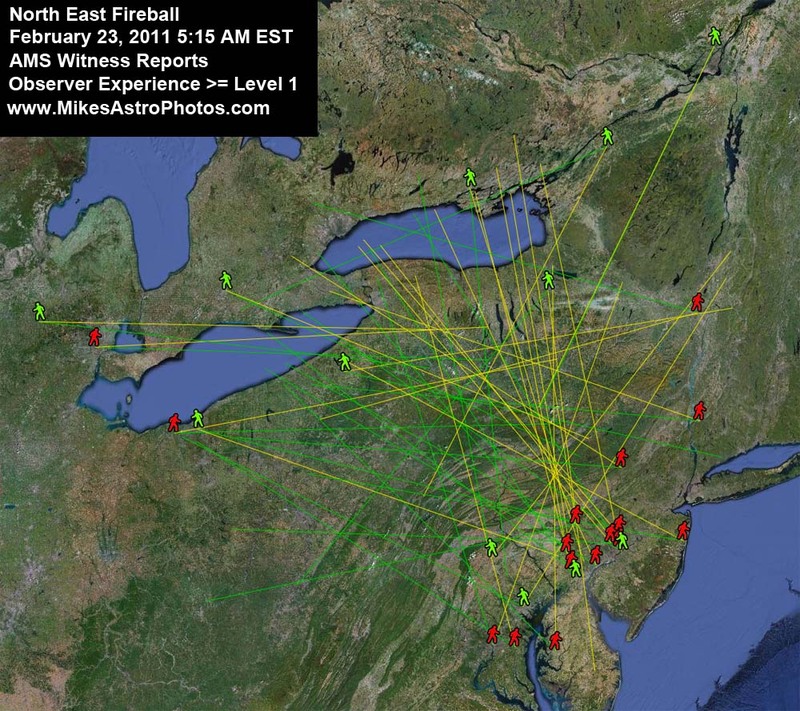 The north east was graced with yet another fireball early yesterday morning. Witnesses from Ontario, Michigan, Ohio, Vermont, New York, Pennsylvania and Maryland all reported seeing a bright green fireball in the sky at approximately 5:15 AM EST. At first glance, this looks to be a tricky fireball. Usually the green and red icons will delineate the flight path pretty well, but in this instance, the green and red icons, don’t help make much sense of the flight path. One of the biggest challenges with making sense of the witness reports is eliminating the noise (or bad reports). For big events (and small ones) there are always reports that conflict with each other, so its a bit of an art to determine which reports are good and which are bad. 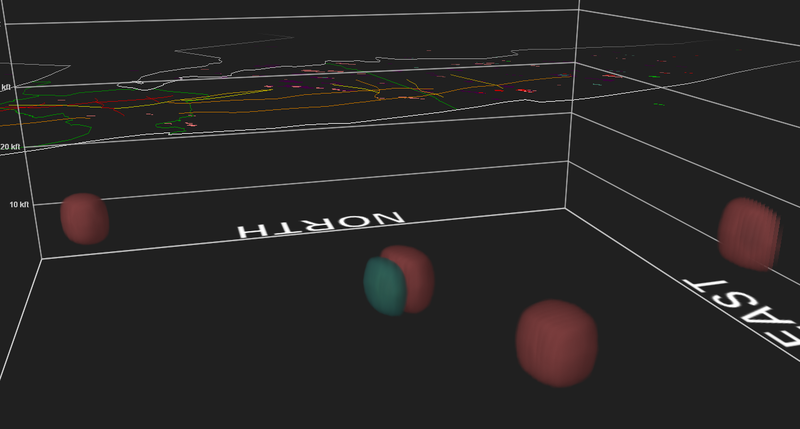 To help combat this, I recently added a field to the AMS fireball report form called observer experience. The purpose of the field is for the witness to rate his or her observing experience — 1 = no experience and 5 = very experienced. Now it looks like we have a clear ending point. To determine this we try to find a common intersection among all of the yellow lines. The flight path, is still a bit unclear to me, but there are two reports on the western side of the track that indicate “Up To Down” movement. This generally means the witnesses’ field of view is usually parallel to the meteors flight path and the meteor is moving away from the witness. For this reason they do not see side-to-side movement. Because of this, my initial estimate is West to East movement, starting in Michigan flying over Lake Ontario and ending on the Pennsylvania-New York border near Addison, Lawrenceville and Horseheads New York. agreement for the timing plus it seems to been a bit brighter with a majority of those reporting that the peak brightness exceeded that of the full moon. Refer to reports 83 and 86. Dirk Ross from Toyko tipped me off to an increase in meteor activity on January 10th, 2011. 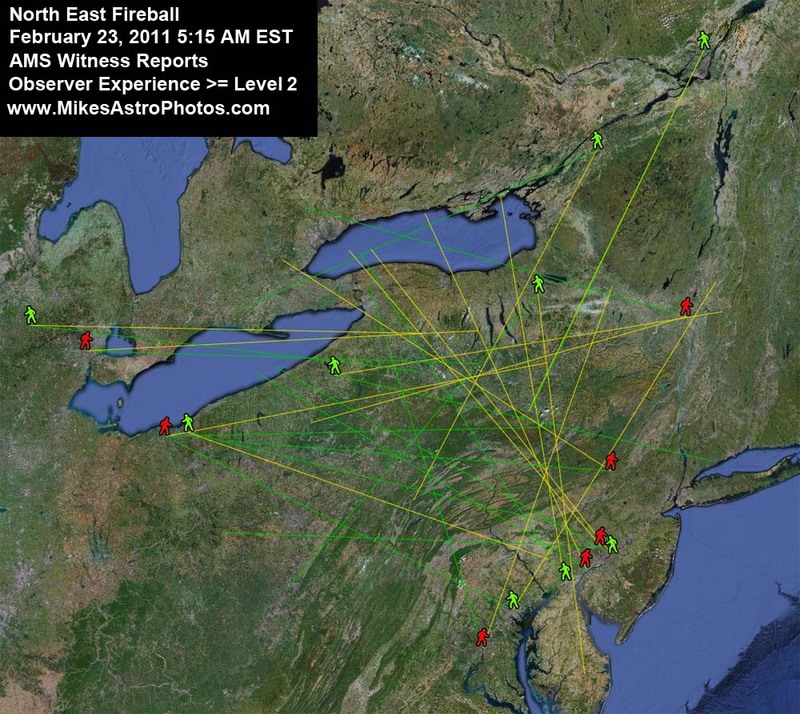 Since that time there has been at least 7 significant fireball events in the US alone. If you pay attention to the reports, stories and witness accounts you will see that subsequent fireballs are being observed after the main event. This is a recurring theme with several of these events. There is not much support in the community for the NEO theory being the reason for the increase. There is also not a consensus that there even is an increase in activity to begin with. I believe the multiple events reported yesterday in conjunction with all of the recent big fireballs we have been having is potential evidence for a new meteor stream or some other phenomena. Reports are now coming in from North Carolina and Georgia about a large green meteor that just came down. The reported times are between 20:50 – 21:00 EST. I was driving in my truck talking with a friend. We had the windows rolled up and the heater fan on. I didn\’t hear anything from outside the vehicle. General_Remarks = I was driving towrds work on Forestdale Dr between the Forestdale apartments and the K-Mart. Through the windsheild I saw a very bright fireball with a tail streaking across the sky. I lost sight very quickly when it went down behind trees/buildings. This happened on a very clear night, and it was an amazing sight. The best shooting star I have ever witnessed. It was so bright and large that I was waiting for an impact! Could this be more evidence of a new meteor stream? Approaching asteroids? Solar grazing comets? Inquiring and paranoid minds want to know…. If you witnessed this event, please report it to the American Meteor Society and also leave a comment here or email me. I’ve been wanting to post an update about each of the meteors that have fallen recently, but because there have been so many I don’t have time to give each the attention it deserves, so I’ve decided to do a multi-meteor-update. In this update I will include AMS meteor plots and any other publicly available information on the following falls: 12/28/10 – PA, 12/29/10 – PA, 1/08/11 – Mississippi and 1/12/11 – Minnesota. I consider these falls to be significant because they were seen from multiple states and the number of ams reported witnesses is in the top percentile of reported falls. 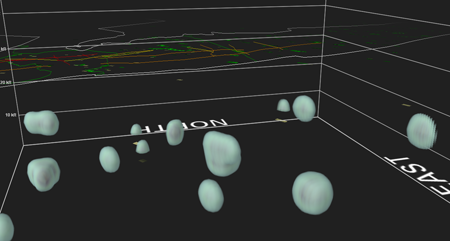 Additionally each of these falls is curious from the stand point that the timing is so close to each other. Reason tells us that sporadic meteor falls are random unrelated events and there is nothing linking a fall today in Pennsylvania to a fall tomorrow in Mississippi, HOWEVER, the sheer random coincidence of time and space for all of these events is at the very least odd. Further more several of these falls were accompanied with reports of subsequent falls in the same locations shortly there after — meaning multiple meteors falls. There is not enough data here to make any conclusions, but I’ve been keeping close tabs on the large meteor fall rates over the last 2 years and the last 2-3 weeks has been heavy in meteor falls IMO. Additional Information: Second largest reported fall of 2010. Wisconsin was the first. There was a good conversation on the meteor observing list today regarding the ‘perceived increase in fireball activity’. The conclusion from all participants was there was no link to the recent fireballs and the passing of near Earth asteroids. Most agreed there was also no reason to conclude we are even experiencing an increase in fireballs anyway. Carl Hergenrother, a NEO researcher, explained there is no correlation to witnessed fireball activity on Earth and NEOs that are reported in close approach to Earth, because, these reported NEOs are only a small subset of the actual NEOs flying by everyday anyway. perceived increase in fireball rates for a certain time with approaching NEOs in that same time frame is a fallacy. It would be like saying, fireball rates went up right after christmas, that must be why those dead birds are falling from the sky. Bob Lunsford of the American Meteor Society pointed out that an increase in reported fireballs does not correlate to an increase in actual fireball rates. It just means more people are seeing them and reporting them. This is a trend he has seen with the AMS reports since they were started. Explanations for this can include: more people with computers and internet access, increased interest in meteors and fireballs, better news coverage and better promotion of the AMS reporting form. As humans we have a need to find meaning and explanation for things that happen when often times there is none. Sometimes rocks just fall from the sky and it doesn’t mean anything at all. This appears to be the first video of the Mississippi 1/11/11 fireball. 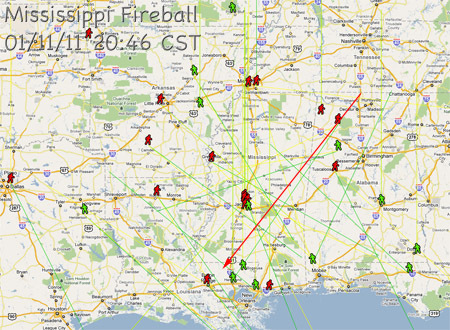 More fireball reports keep coming in! 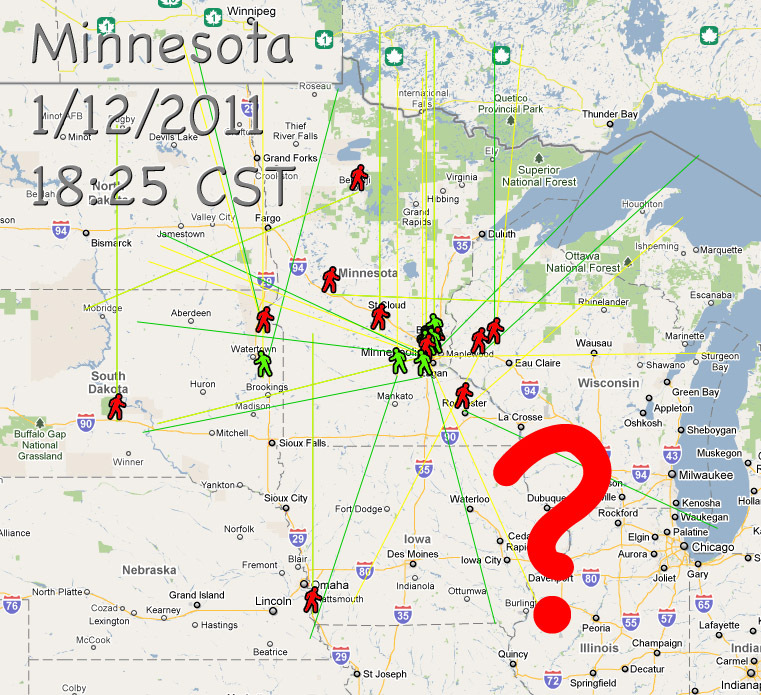 This time from Minnesota and what makes this extra strange is — there are some reports of multiple fireballs. 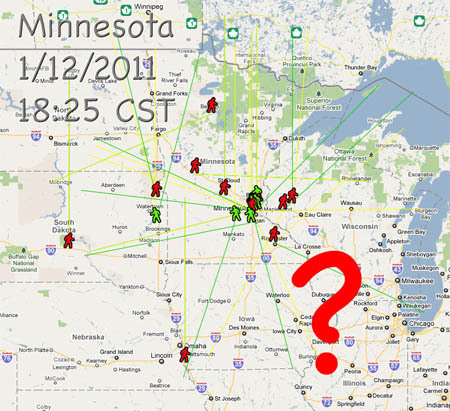 As few as 1 and as many as 3 fireballs have been reported from different parts of Minnesota. The primary event appears to have happened at approximately 6:30 PM CST. This event was also seen from Iowa, Nebraska, South Dakota and Wisconsin. “It started out very bright and was about the size of a large marble, ending roughly the size of a pea. From my angle, it actually looked like it was headed towards Ames, Iowa, but I realize that my estimate there is probably way off. It definitely appeared to be headed in a downward trajectory. (Of course, I’m not an expert at these sorts of things. It was however one of the largest, brightest, and definitely most colorful fireballs I’ve ever seen. (Ok, I’ve seen two now. This wasn’t as big as the first, but was brighter and more colorful. I will update again as more information becomes available. According to Twitter, Facebook and AMS reports, a massive fireball was seen all over the south last night at approximately 8:40 central time. 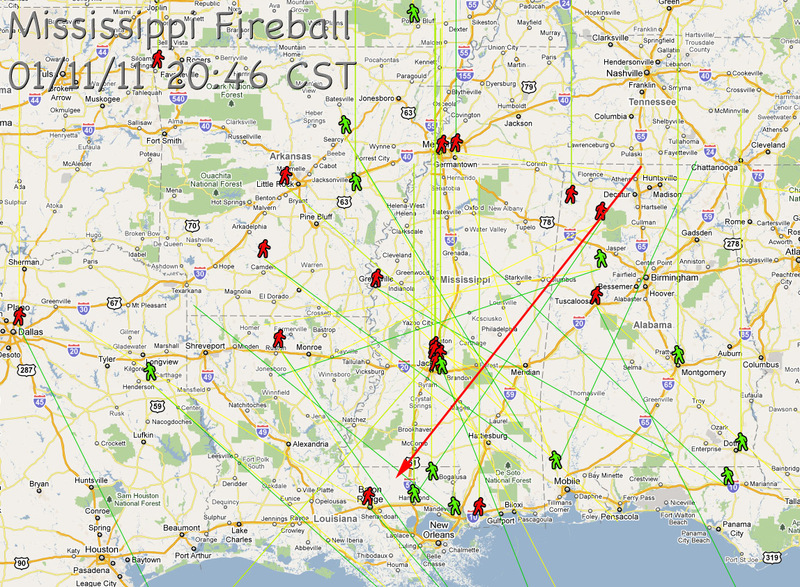 Fireball reports are coming in from Alabama, Mississippi, Texas, Arkansas, Louisiana, Tennessee, Oklahoma and Florida. Sonic booms were reported and early analysis indicate it was traveling south west to north east. There have been NO photographs of this event yet. There have been 2 FAKES floating around though. Here are some news reports. Early reports indicate it may have hit near, Poteau Mountain OK, but this has not yet been confirmed. There are most certainly meteorites on the ground somewhere left behind by this cosmic visitor. The meteorite hunting community is already in rally mode. I would expect a meteorite is found within the next few days. 1) no this is not the meteor apocalypse. Everything is ok, so don’t panic! 2) meteorites don’t burn green because of copper, they burn green because of nickle and iron. 3) this meteor was most certainly bigger than a pebble. Without being dramatic, it was at least the size of a basketball and could have been as big as a small car. 4) There is probably NOT a crater on the ground somewhere, but while the chances are extremely rare, this might happen. 5) Regarding terminology: its a ‘meteoroid’ when its in space; its a ‘meteor’ when it is in the sky on fire in Earth’s atmosphere; its a ‘meteorite’ when it hits the ground. If you have any pictures or videos of this event, please email them to me. 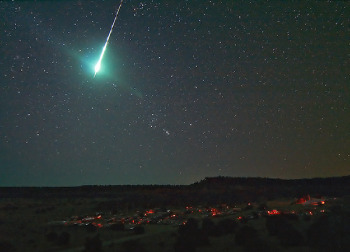 If you saw this spectacular event, please leave a comment and also report what you saw to the American Meteor Society. I will update again with the AMS plots and possible trajectory asap, so bookmark and check back again soon. On 12/29/2010 a second meteor shot through the skies west of Maryland at 8:30 PM. This made for an exciting week and is causing some confusion with peoples observations. Two big fireballs in the same location 26 hours apart is certainly an odd coincidence. 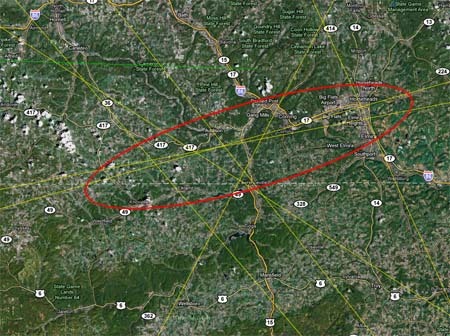 Reports of the 12/28/2010 meteor touching down in Fredrick and being found are most certainly FALSE. Tuesday night’s meteor is looking to have touched ground somewhere in South Central Pennsylvania. 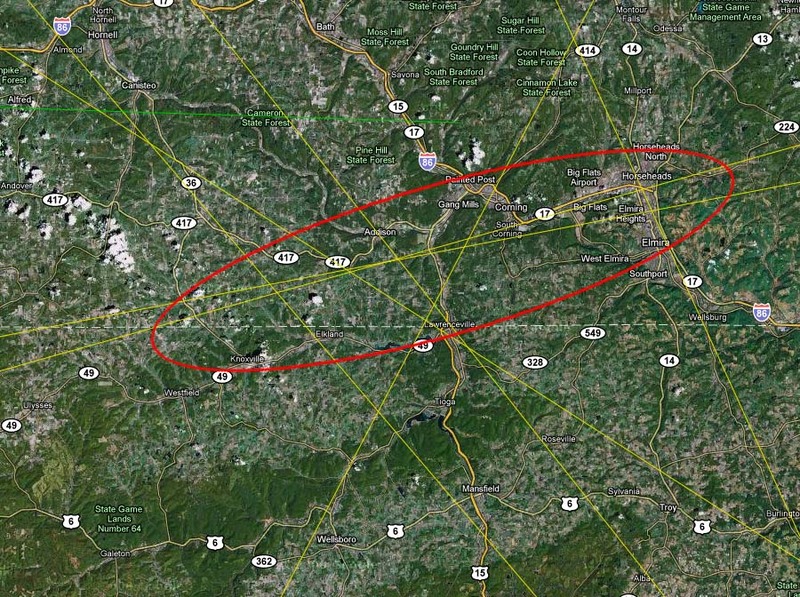 We are not sure just yet where Wednesday night’s meteor landed, but it was somewhere West of Freeland MD. I’m working on the AMS plots for both events, but won’t have these together for a few more days. 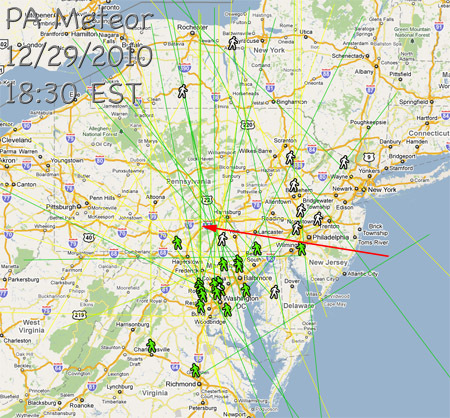 All these meteor falls sure are exciting, but guess what… Not one of the 6 meteors that have flown across the Maryland skies since July 6th, 2009 has come even close in size to the Mason Dixon Meteor. Nation wide, there has not been a single report of homes shaking to the level that the MDM caused since July 6th 2009. The closest was Wisconsin which resulted in 100+ meteorite finds, but even Wisconsin did not shake homes like the MDM. These facts are encouraging for those still searching for the Mason Dixon Meteor. 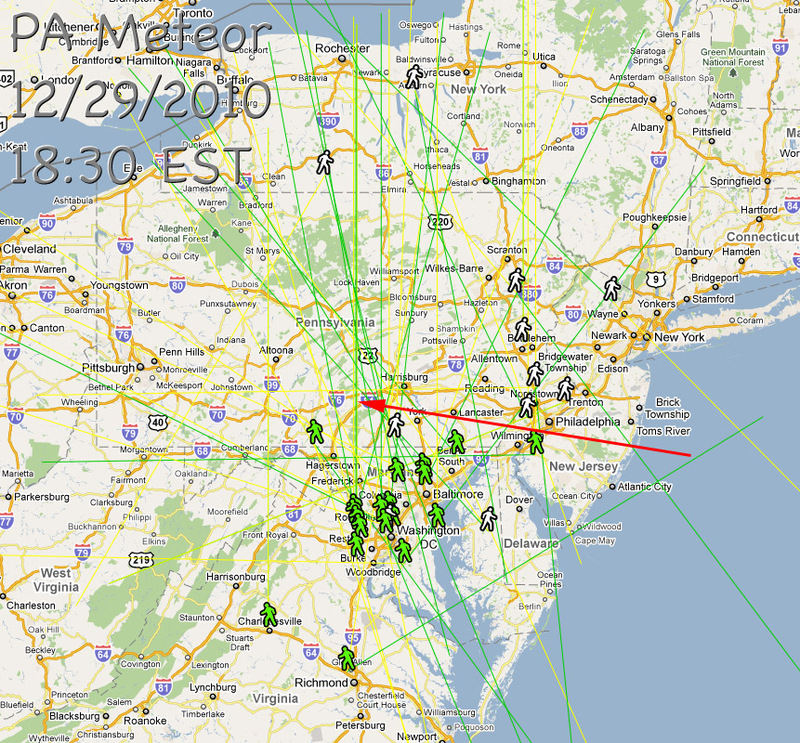 Another fireball meteor fell over Baltimore and PA on June 24th, 2010. Orioles fans watched it streak across the Baltimore sky line during a night game Thursday. How cool would that have been!? Plus the O’s won. Here’s a map of the AMS witness reports, some reports from Maryland Weather Blog and the York Water video (yes York Water captured this one too). From an early analysis / quick eye up it looks like the termination point for this fireball is somewhere north west of Harrisburg. I have some new data that I’m working with while leads and information continue to come in. Its looking like meteorites may have landed in the Appalachian mountains which will be very difficult terrain to go meteorite hunting in. Here are a view news stories. The York Daily Record story has a video of the fireball as it terminates. 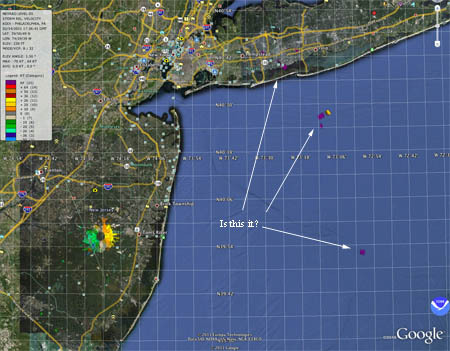 A large fireball was reported along the east coast early Monday morning. Observations were reported all along the east coast including: South Carolina, Virginia, Maryland, Pennsylvanian, New Jersey, New York, Connecticut and Massachusetts. No videos of this great site have yet to be reported. Over 30 AMS reports where submitted and after reviewing the details on these observation it looks like the meteor landed in the Atlantic Ocean. Too bad, it sounded like it had all of the characteristics to be a meteorite dropper. 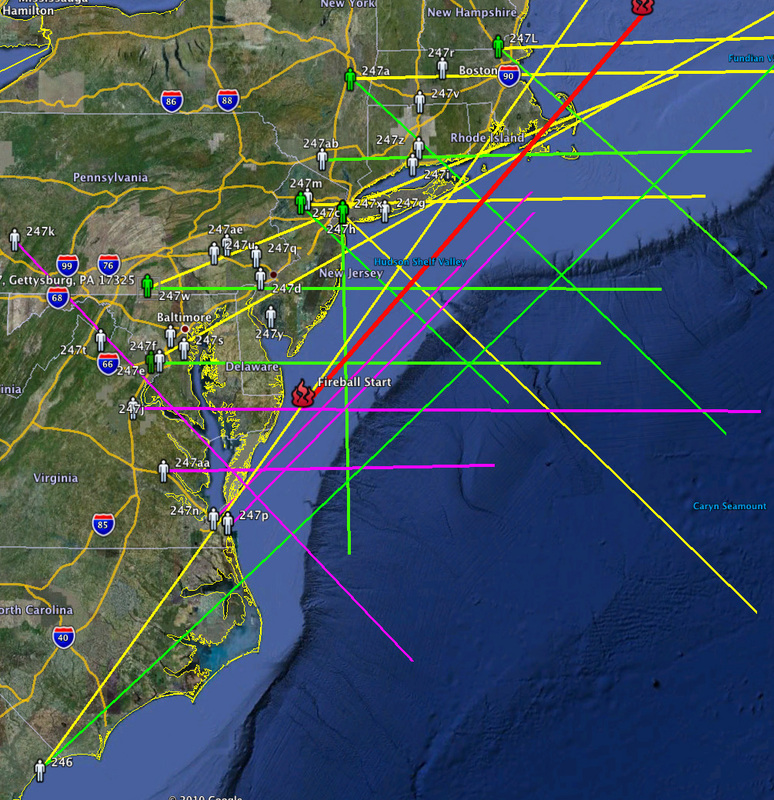 Here’s a map of the AMS reports along with an estimated meteor path based solely on these reports. 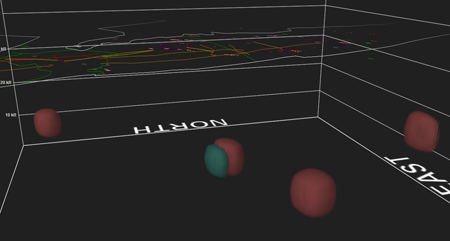 To help understand the image above: Green lines are the first point a witness observed; yellow lines are the second point observed; purple lines are from witnesses who only reported a single point; the red line is the estimated meteor path. From what I can tell the meteor was headed on a south west to north east path, hugging the coast line. This meteor path is an estimate based on the AMS reports. I think its safe to say this thing landed in the drink, so there’s not much point in refining the trajectory more than this. If you have a better idea about the path of this meteor lmk. Here’s a write up on the fireball from Frank Roylance’s Blog. There are a lot of great comments about the event on this site. 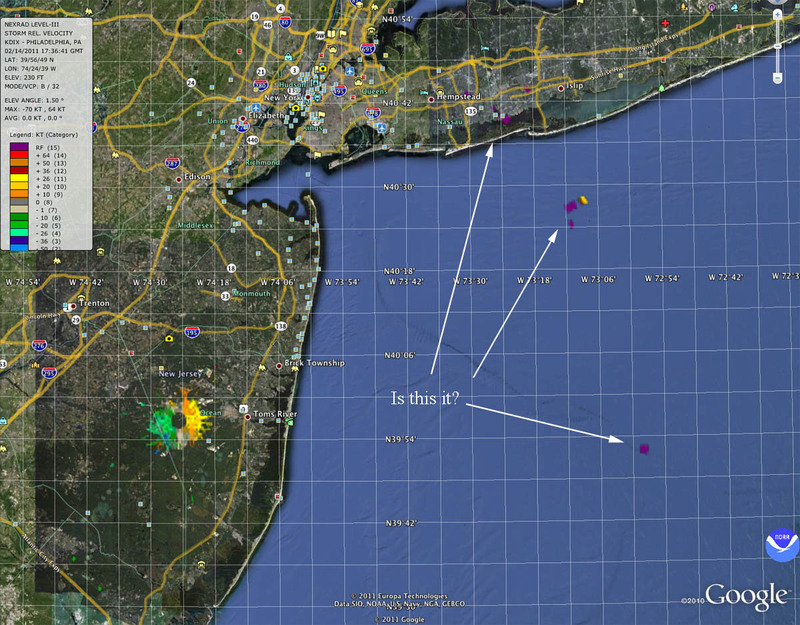 Here’s a link to the google earth KMZ file for this fireball. Coincidentally there was another large fireball reported over Wisconsin within 15 minutes of this one. 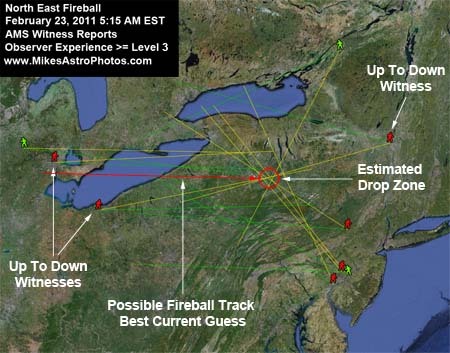 The WI fireball was a different event all together and most likely not related, but this seems to be an odd and rare occurrence [two big fireballs so close to each other in terms of both distance and time]. I’m a little bummed out I still don’t have my allsky cam setup. I’ve missed two great fireballs since deciding to get an allsky cam setup. I’m on it now.